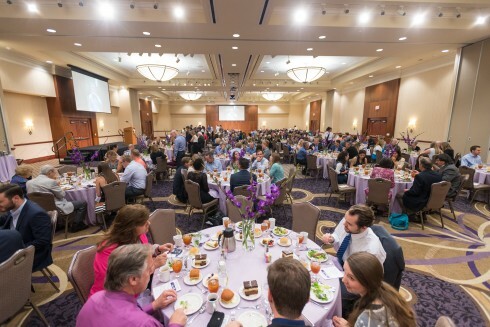 Every May, COBA holds a dinner to celebrate our graduating seniors as well as to honor outstanding students, faculty and staff. On Friday, May 6th, almost 300 people attended the event held at the Hunter Welcome Center. Dr. Andy Little welcomed the crowd and recognized students and their families for all of the hard work and sacrifice it took for them to reach the milestone of graduating from college. Families gathering to celebrate their May graduates. Dr. Andy Little greets the May 2016 graduates and their families. 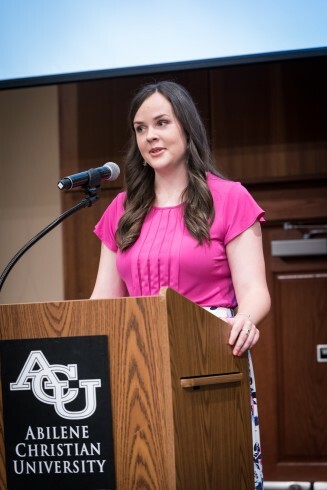 Each year we ask a student representative from each department to provide an Au Revoir to their classmates and faculty, reflecting on their experiences in COBA and at ACU. 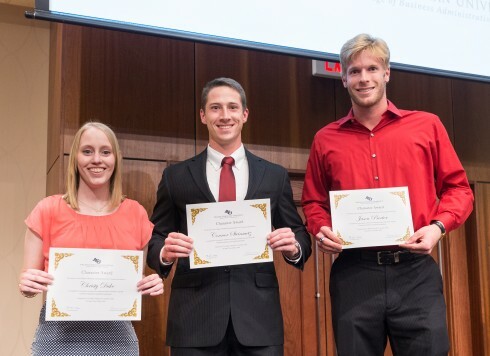 This year’s student speakers were Hayley Griffin, management major from Quanah, Texas and Austin Cotton, financial management major from Keller, Texas. Each reflected on their time in the College of Business and thanked faculty and their parents for making a difference in their lives. It is also a COBA tradition to ask a parent of one of our graduates to speak on behalf of all parents of the graduating class. 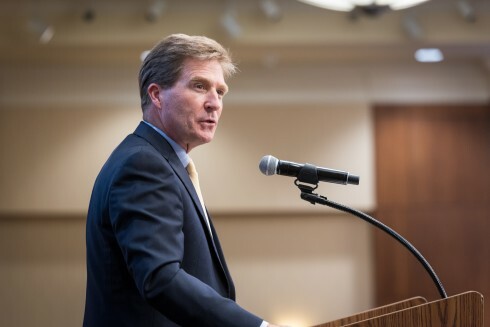 This year we were delighted to have Rick Lytle, former COBA Dean, current Director for the Lytle Center for Leadership and Faith Development, CEO and President of CEO Forum, and father of now three ACU alumni, as our parent speaker. 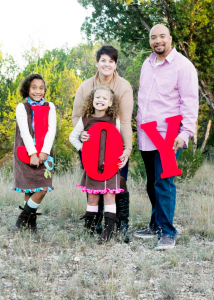 Rick is the father of Michelle Lytle, marketing major from Abilene, Texas. 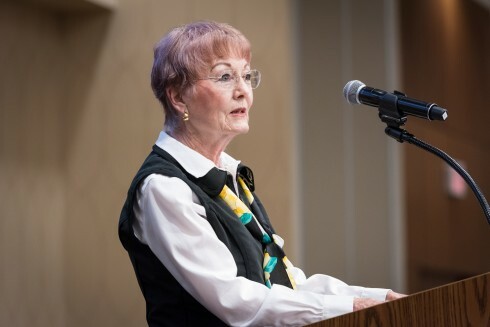 Dr. Lytle encouraged the students to live lives both personally and professionally which make a difference for the kingdom of God in their workplace, community, and home. Dr. Lytle then had the pleasure of introducing the newly named Dean, Dr. Brad Crisp, as Dr. Crisp commended the students on the many activities and accomplishments they have achieved. Dr. Rick Lytle gives the parent address as the father of COBA graduate, Michelle Lytle. New COBA Dean, Dr. Brad Crisp. Dr. 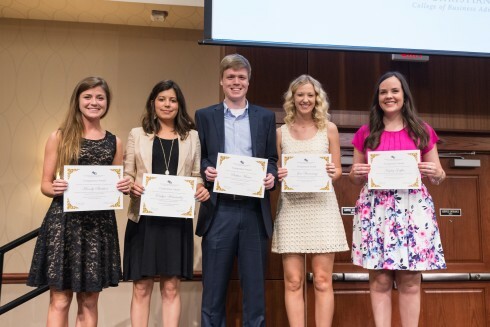 Crisp also recognized sixteen students who were chosen by the COBA faculty that symbolize three COBA values: Competence, Character, and Community. The criteria for choosing students who fulfill those qualities are listed below as well as the names of the 2016 graduates who received the awards. Competence – Professional competence is a prerequisite for capable leadership. 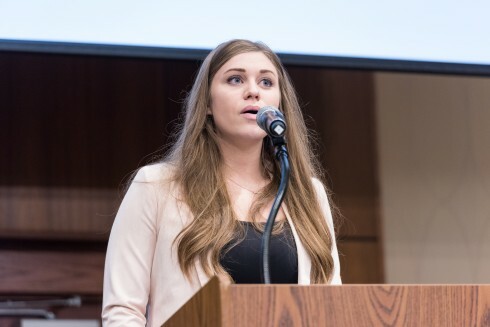 These students have demonstrated that they understand how to create and deliver value in their work, think critically, communicate well, work in teams and understand the complexities of today’s global marketplace. COBA students to win this year’s award are: John Allen, Jaci Browning, Hayley Griffin, Evelyn Hernandez, Parker Mason, and Mandy Stratton. 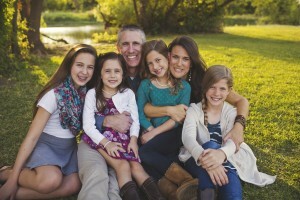 From L to R: Mandy Stratton, Evelyn Hernandez, Parker Mason, Jaci Browning and Hayley Griffin. Character – The intent of COBA is to graduate students who seek to glorify God in their personal and professional lives. These students stand out as examples for being able to discern right from wrong, articulate what they believe and why they believe it and behave consistently with those beliefs regardless of personal consequence. COBA students to win this year’s award are: Christy Duke, Callie Kerbo, Griffin Pedigo, Jason Proctor, and Connor Steinmetz. From L to R: Christy Duke, Connor Steinmetz and Jason Proctor. Community – Successful business graduates give back by providing service and leadership in the workplace, their churches, homes and communities. These students have demonstrated that they understand how to serve and lead in the ACU community. 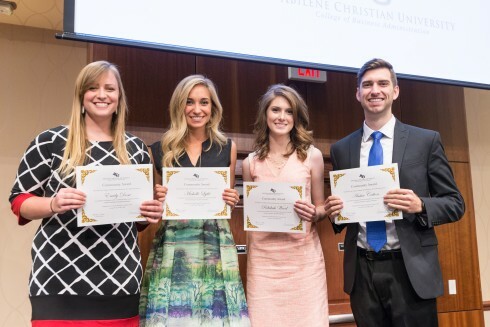 COBA students to win this year’s award are: Austin Cotton, Emily Dosa, Michelle Lytle, Alyssa Timmons, and Rebekah Wood. From L to R: Emily Dosa, Michelle Lytle, Rebekah Wood and Austin Cotton. Each year, junior and senior students in the College of Business vote for their favorite teachers of the year. 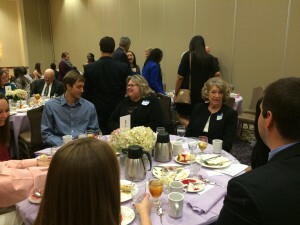 One professor is selected to receive the award in each academic department. 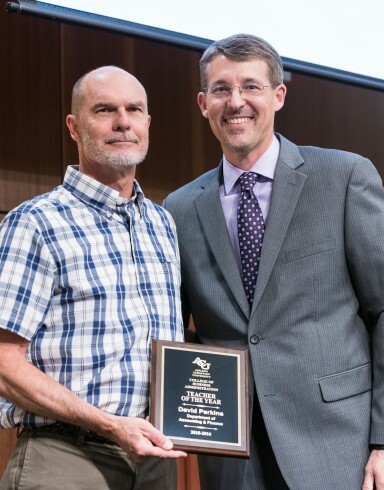 This year’s Teacher of the Year in Accounting and Finance is known for teaching his students the basics of accounting while doing so in a manner that is logical and interesting, for his love of coffee, and for playing his guitar for students. One student said, “He’s always very enthusiastic about the subject and he’s very good at relating to students as well as showing his interest in what the student is looking to do in the future.” Another student commented said, “He has a gentle, kind spirit and was always there to help, whether it be regarding accounting or just what’s going on in our lives. 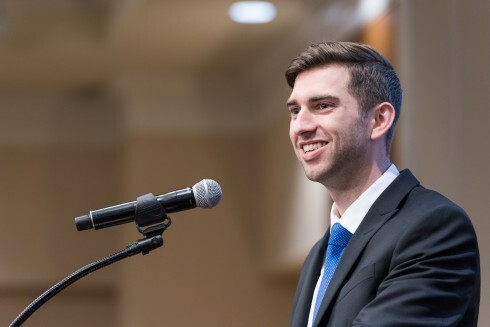 He was one of the best professors I have had in COBA.” The class of 2016 named Dr. David Perkins as Teacher of the Year in Accounting and Finance. Dr. David Perkins, the 2015-16 Accounting and Finance Teacher of the Year. 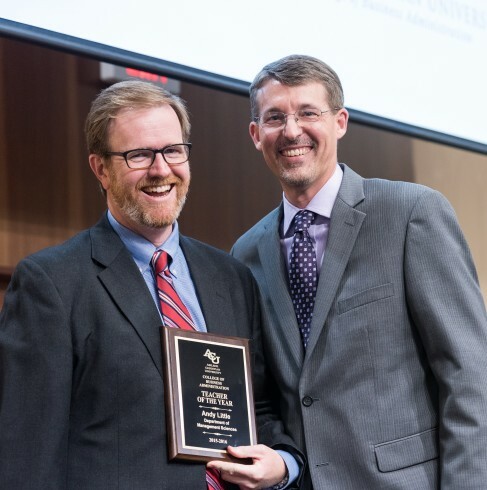 This year’s recipient of the Management Sciences Teacher of the Year award went to a professor who is known as one of the most entertaining professors in COBA. One student commented, “I never expected to learn so much about how BLAW was related to Hot Pocket commercials! He was one of the most entertaining, fun teachers I have had in COBA. Never a dull moment!” Another student said, “When you come into college, you expect to be taught by professors but you don’t expect to have them engage with you and walk alongside of you in your learning. That is something he has done beyond what I could imagine. He’s become more than a professor. He’s become a friend.” The class of 2016 named Andy Little as Teacher of the Year in Management Sciences. Dr. Andy Little, 2015-16 Management Sciences Teacher of the Year. 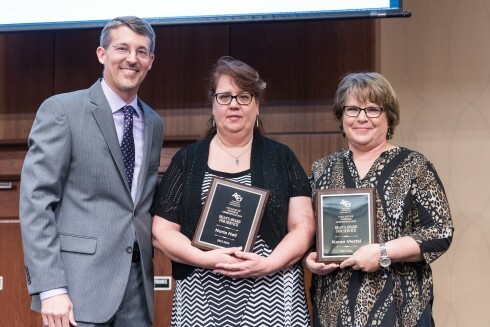 The dean also honored two COBA staff members in recognition of their service to COBA and COBA students. The first 2016 Dean’s Award for Service went to Nuria Hall, academic advising specialist, who continuously goes above and beyond expectations. 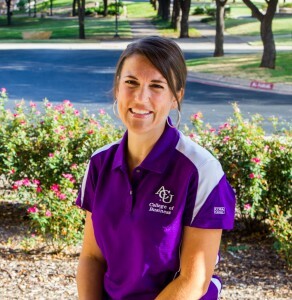 Nearly always she is among the first to offer help, create better solutions, and offer her Christ-like wisdom to enhance the overall experience for our students. Dean’s Award for Service recipients, Nuria Hall and Karen Viertel. The second Dean’s Service Award was awarded to Karen Viertel, manager of COBA student services and academic advising, for her many years of service to the students, faculty and staff of COBA. 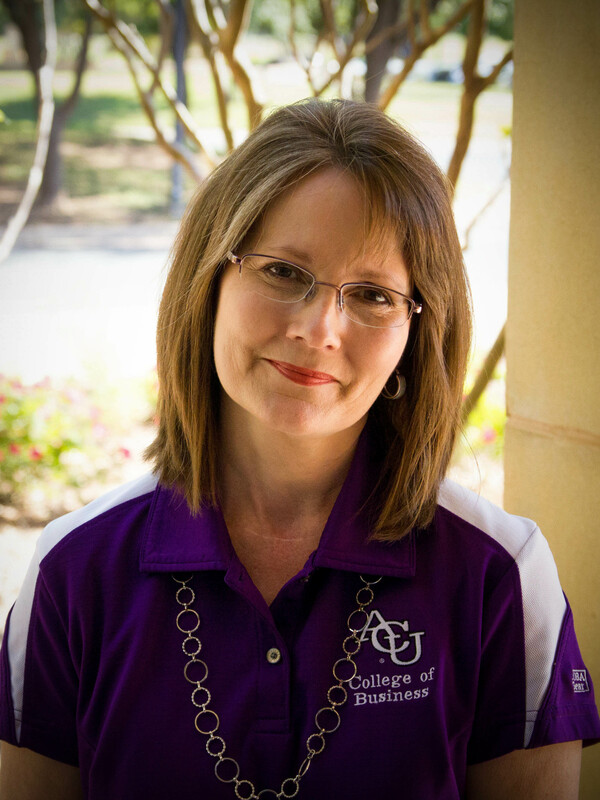 Karen is the definition of team player and is always one of the first to help in any situation, whether that’s advising a student in her office on or a co-worker in the college, always with a servant-leader heart. Associate Professor, Jozell Brister, reads a blessing over the graduates. Congratulations again, students! And to the students, their families and friends, we say thank you for allowing us to be walk alongsde with you over the last four years. May God bless each of you greatly as you enter into this new phase of your lives. 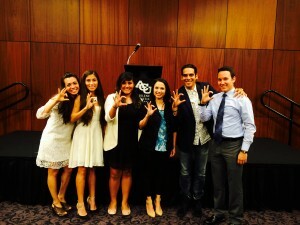 You can find more pictures from the evening on our COBA Facebook page. We will be hosting a separate event to honor December graduates at the end of the fall 2016 semester. Stay tuned for more details! COBA is excited to announce that Dr. Brad Crisp has been named as the new Dean for the College of Business Administration. 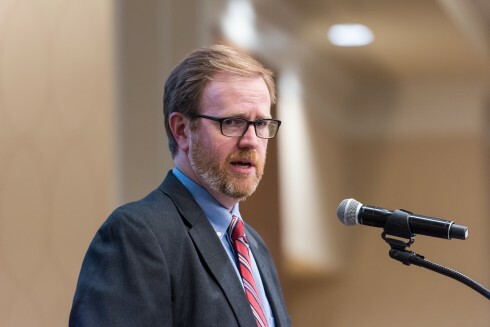 In a statement from the Provost’s office, Dr. Robert Rhodes said, “Based on the recommendation of the search committee, I am pleased to announce the appointment of Dr. Brad Crisp as the Dean of the College of Business Administration effective May 9, 2016. 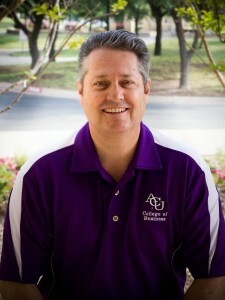 During his 10 years on the faculty at ACU, Dr. 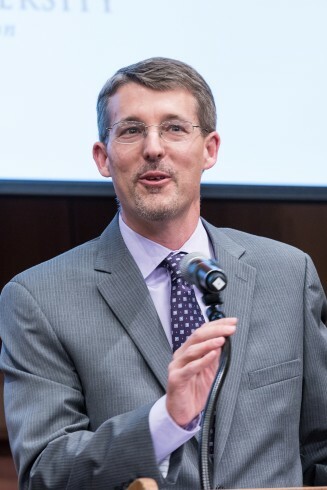 Crisp has served as director of the School of Information Technology and Computing, which earned ABET accreditation under his leadership; and he launched the online Master of Business Administration as its first director. I am confident in his ability to lead the College of Business Administration. 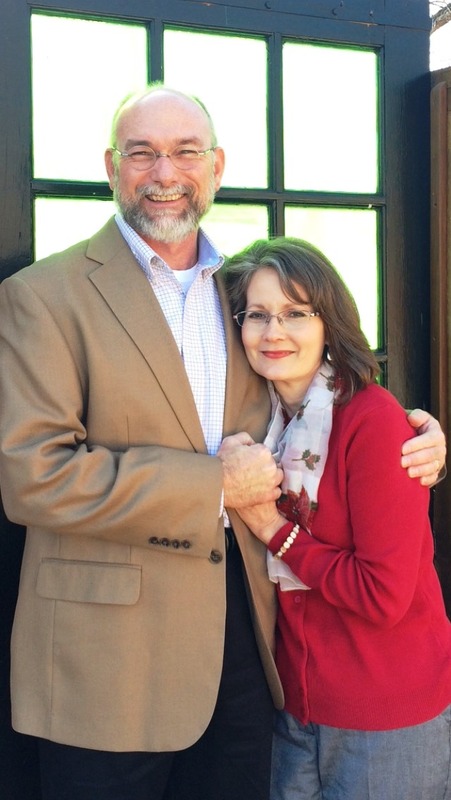 He is committed to supporting faculty and to preparing students well through his continued commitment to academic excellence and his sharp focus on intentional Christian spiritual formation. Please join us in congratulating Dr. Crisp as he begins his tenure as Dean. 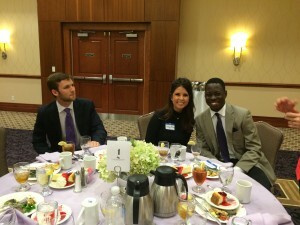 On Tuesday, March 29th, generous donors and scholarship recipients enjoyed a luncheon in memory of Ruth Allen Griggs. 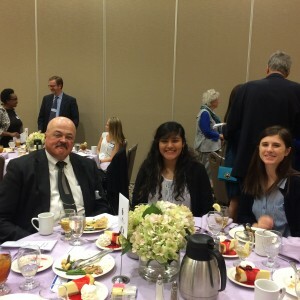 Ruth’s children, Jack Griggs and Ann Griggs Berger, along with their respective spouses Ann Griggs and the late Bob Berger, established an endowment in 2015 to honor their mother and her spirit of generosity by having a yearly luncheon bringing together COBA donors and students. 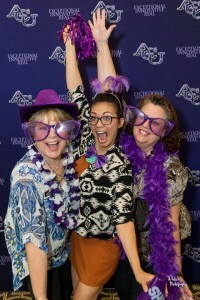 The goal for the endowment is to honor and thank donors for the scholarships given to the College of Business that allow so many students to attend ACU and to participate in many of the experiential learning opportunities that COBA offers. Don Crisp, accounting alumnus (class of 1964) from Dallas, spoke about he and his wife, Carol’s experiences as young college students at then Abilene Christian College. Mr. 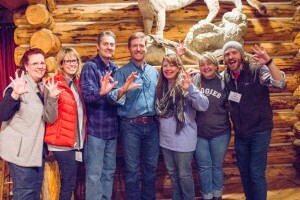 Crisp encouraged donors to continue to pour into the lives of students at ACU and exhorted current students to give back to students in the future. I have a B.S. degree from Lubbock Christian College from back in the “dark ages”. I have been a business manager for a medical clinic, a school nurse/secretary, and an academic advisor. My most important work has been being a mom and now grandmother. 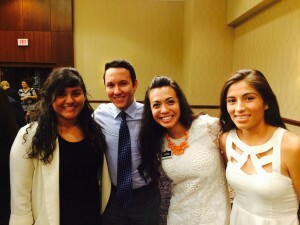 I am so privileged to serve as an academic advisor in COBA. I have been here for more than 10 years and I.LOVE.MY.JOB. The three Amigos. Karen Viertel, Samantha Matta and Nuria Hall. What drew me here was the opportunity to work with students every day. No two days are the same and it is NEVER boring. I love watching the life metamorphosis that happens between a student’s freshman year and graduation day. It’s truly remarkable to witness and I get to have a front-row seat for the whole show!! Most come to college scared and afraid and not sure at all about what they want to do after college. To watch them grow wings and be ready to fly off to a new job or adventure upon graduation, ready for the world is a pretty incredible feeling. 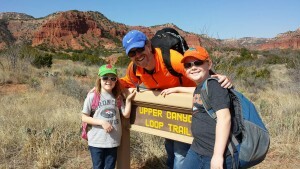 My husband Mark and I operate a large family ranch north of Abilene. There we raise cattle and LOVE to build things: fences, houses, good memories. I enjoy “junkin’” and repurposing furniture, etc. I love a good flea market or junk store almost more than anything. My favorite thing to do is to be with my family. 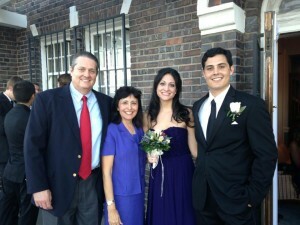 We have two grown children, both married and now two grandsons. At ages 3 years and 7 months, they are simply amazing. I can’t get enough of them. I remember landing my first job as a business manager for the only obstetrician in the small town we lived in, just prior to college graduation. 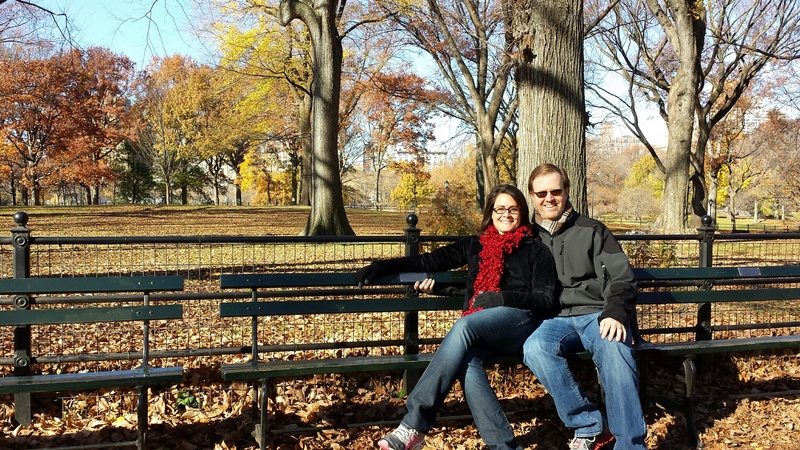 I had NO IDEA what I was doing but he was patient and I worked hard to soak up everything I could while I was there. In the two years I worked for him, we made tremendous improvements in office efficiency and accuracy. Plus, I learned a lot about teamwork. Without the ability to be a team player, you severely restrict your effectiveness in any organization. Work chemistry is essential. Yes. 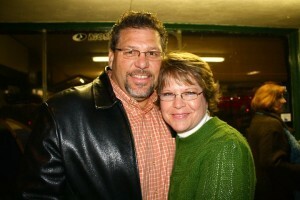 Mark and I are very involved with Global Samaritan, Dry Bones in Denver and our church family. I also really love to help with Meals on Wheels. My grandmother has always been my role model, but now I would also add my mom. Granny was a very strong woman that raised two children, one of which became my equally strong mother. 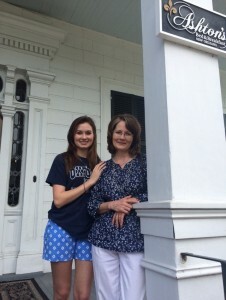 My mom became a widow at 28 and managed to raise myself and two sisters with the help of her widowed mother. I look back now and wonder how they did it. My mom was a rancher/farmer. She drove a tractor, plowed fields and pulled calves – not the type of work any other mothers at the time did. They both showed us that being a strong woman is a good thing. As a result, I’ve always been pretty much of a tomboy and am very at-home with outdoorsy ranching pursuits and I don’t shy away from hard, manual labor. In fact, I like it. It’s good for the soul. 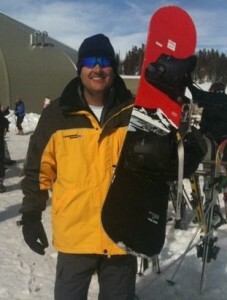 I would list two teachers: Dr. Gary Evans at LCC. He was my first college Bible teacher and he will never know the impact he had on my life and thinking about being a Christian. Incredible man and mentor. 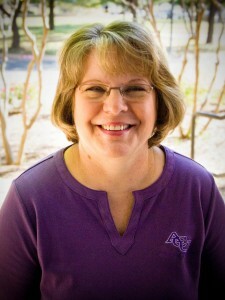 Also, Dr. Christa Dobbs, my accounting teacher. She was an amazing woman and fantastic teacher. The ability to fly and also time-travel. I mean, come on…who wouldn’t? I LOVE to travel, I know how to use a cutting torch and enjoy ranch work. I am learning how to weld. I graduated from ACU with a BA in Political Science in 1997, then received a JD from Texas Tech University School of Law in 2000. I also earned an MA in History from West Texas A&M in 2014. 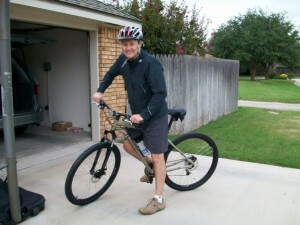 I practiced law from 2000 to 2010, primarily at a regional law firm in Amarillo. My legal practice encompassed employment law and business litigation. I teach the business law classes, and occasionally teach a class related to ethics and corporate social responsibility. I also teach Honors College colloquia from time to time. In addition to teaching, I also serve as Associate Dean of the College of Business Administration. 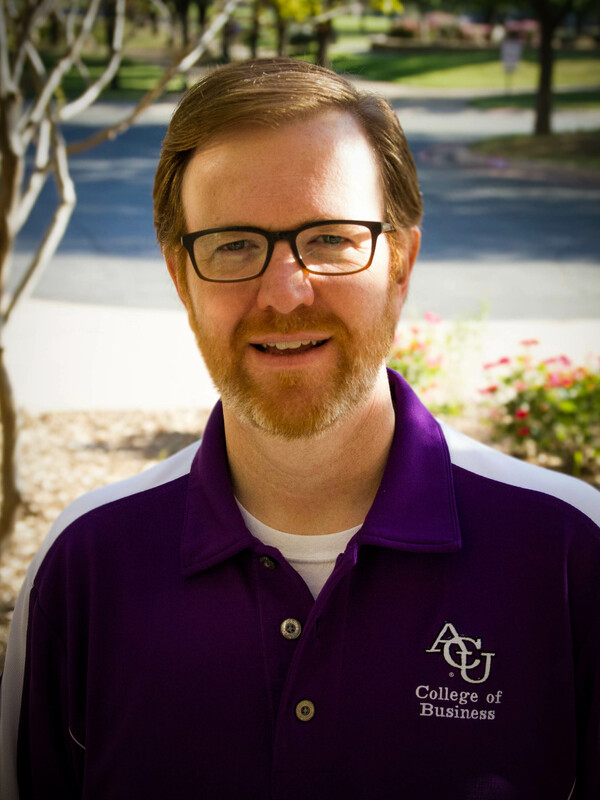 I grew up the son of an ACU professor, and I had a wonderful experience at ACU as an undergrad, so I think I always knew in the back of my mind that I wanted to be back in the university setting at some point. Students have a spirited vitality and sense of hope within them that keeps me young. 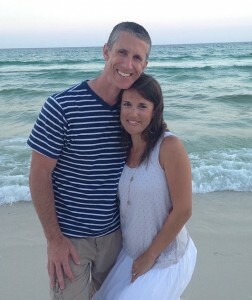 I really enjoy walking alongside them at this transitional phase of their lives. In my better moments, perhaps there is an opportunity for me to share my faith journey with them, and for us to learn from one another. This is a hard question to answer. At a very superficial level, yes, I gave up considerable income and positional power as a partner at a regional law firm to work here at ACU. 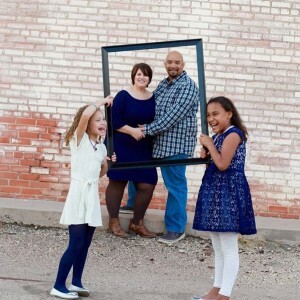 But during the time period in which I made the transition to teaching (around 2010), I was in the process of discovering that money and power weren’t my priorities anyway, so I’m not sure I was giving up something I really wanted in the first place. I guess I would say I gave up something I thought I wanted. I like the wilderness—hiking, backpacking, skiing, camping with family and friends, etc. I like music. I read a lot of books about history and religion. I try to be involved with my church family. I had a student named Brody Smith who insisted that we listen to part of the Top Gun soundtrack one morning in BLAW 461. I liked Brody. And I liked Top Gun. So I accommodated his request. It was a great class period. I’m sure everyone learned a lot that day. 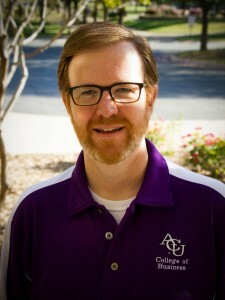 I was honored to be ACU’s Teacher of the Year in 2012. I’ve been on the boards of directors for several non-profits over the last 15 years, most recently the Christian Village of Abilene. He will likely be embarrassed by this mention, but I’ve tried to watch Monty Lynn closely to see how I can better emulate him as he emulates Christ. Mel Hailey in the Political Science Department consistently made me think deeper than any other professor. In a series of three courses dealing with political theory, he led us through an extended collection of readings that addressed the central question, “What is justice?,” which has animated much of my professional and intellectual career ever since. Who’s to say I don’t already have superpowers? I’m a big fan of the punk band Social Distortion. As before, this is a hard question to answer. The easy, church-y way to answer it would be to say, “I want others to know Jesus when they know me.” And this would be a true statement, so far as it goes. But I’m also realistic enough to know that I am not Jesus, and that the Jesus people get to know when they know me probably looks and feels different than the Jesus they might get to know if they know someone else. It’s also a hard question to answer because I’m a private person, and I’m not comfortable being known through social media at all. This is not a space in which I want to live, so I choose not to disclose much in these kinds of formats. I prefer unmediated relationships in which to know others and be known by them. I graduated from ACU with Social Work degree in 1988. 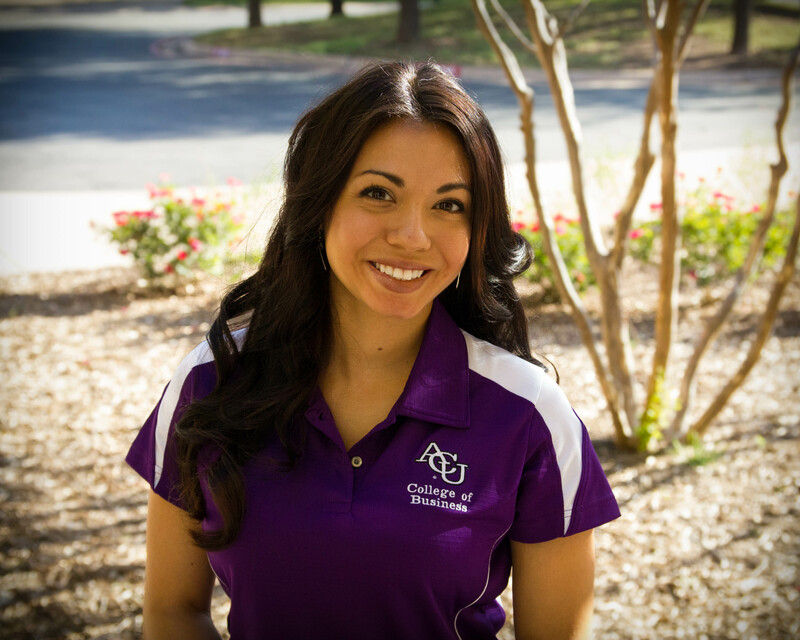 I worked as an assistant for a CPA in Ft. Worth before coming to ACU. 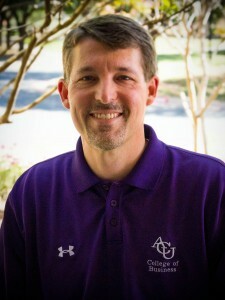 While at ACU I worked as the assistant director in Gardner Dorm and director in McDonald Dorm. After graduation I worked as a social worker with Big Brothers Big Sisters. I was honored to work at home while our children were little and went back to work at Big Brothers Big Sisters about the time they were in middle school. I assist (read: try to keep up with) Dr. Lytle, oversee the COBA budget and the various tasks associated with the upkeep of the Mabee Business Building. I’m also on the staff senate. The fresh energy that students exude and the creativity and talent they are developing is inspirational – and I’m not exaggerating. It’s really fun watching students become who they are. Making new friends is one of my favorite things so connecting with students is really fun to me. I’m in a good place! I enjoy gardening, traveling, antique shopping, cooking/baking, camping (mostly the part where I sit by the fire), visiting with friends and keeping connected with them. All of these things are more fun when I’m in the company of my husband, Monty. (We’ve been married 25 years!) We also care for my 92 year old father who lives 3 blocks away from us in his own home. I enjoy anything that touches, affects, is related to or involves either of our kids who are both at ACU: Seth (Senior) and Leah (sophomore). They are both pretty cool people, to say the very least. I spend a good deal of time praying for them, their friends, their future spouses and their lives in general. I have been a Big Sister with Big Brothers Big Sisters for 5 years. My Little Sister is 15 now! My role model has always been my mother. Although she died 22 years ago she continues to influence me. 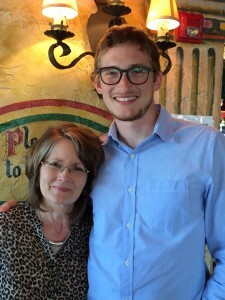 Mom came to know God when I was approaching my teen years so I had a front row seat at a pretty critical time to observe her and my dad as they made significant changes in their lives to follow Christ. I learned about accepting grace and desiring to please God and being real and being hospitable from her. I also learned from her the value of giving people a chance. She really grasped the concept of God doing mighty things when people are open to Him and not giving up on people because of that. John Willis, of course. His teaching was excellent and he had a way of making sure the students knew he was available to us. And those windmill cookies were to die for. Okay, I always hate this question. But if time travel was a superpower I would pick that. There are a couple of moments in history I’d really like to witness. That I lived in Scotland for a little over a year between my Sophomore and Junior year at ACU.